Downtime is as a period of time when something, a network, piece of machinery or the whole factory is not in operation. Every minute of downtime is a potential revenue loss for a manufacturer, no matter what is the cause of it. An unplanned one, resulting of a failure or a malfunction is usually the ultimate worst-case scenario, for in most cases it is far more expensive and lengthy than a scheduled maintenance break. Production lines are increasingly complicated and demands for efficiency are high in today's manufacturing industry. Digitization initiatives; connecting people, equipment and computers, drawing and analyzing data from multiple sources, have brought new tools to minimize unexpected failures of machines in production. Augmented reality is one of the key industry 4.0 tools to make operations more productive and it has since long been connected to predictive maintenance methods. Today, maintenance is one of the most common use cases for industrial AR. Let’s take a quick look at a few examples, how AR can help prevent or shorten those horrid downtimes and save you serious sums of money. an operator or a maintenance technician can see the device’s key condition or usage data at all times and alerts can be issued if a monitored value reaches unacceptable levels or the value behaves according to certain pre-established rules. AR does not only help you see the trouble ahead, it enables a worker to react to it instantly. An interactive AR app allows an operator to make fast adjustments to the process, or if needed, to bring a struggling machine to an emergency stop before damage is caused to the equipment. In simple use, cases you can follow key values of certain equipment, like energy consumption, vibration, temperature, oil, lubricant or coolant status, conductivity data, or some other values defined critical for the process, to help identify problems before they escalate. The further you are down the digitization road and the more sources you can stream data from, the better picture you can draw of your machines, the production line or the whole plant. For example, in Hannover Messe this year, we cooperated with Connected Production to demonstrate the power of AR and Industry 4.0 platform together. With an IoT platform in the background, streaming data from MES, we could bring real-time production data such as energy consumption and alerts to a smartglasses’ display and ensure problems were caught before they even were problems. Speed up troubleshooting by giving access to the right information fast. For example, provide a maintenance worker with a quick access to the setup parameters of a machine’s control panel, so that there’s no need to scroll through useless data first to find the right ones. Show normal values to be compared with the faulty ones, show work orders, logs, maintenance history and previous repairs made to the machine. Make the actual maintenance work more efficient with instructions easily available on smartglasses. By providing instructions via smartglasses the work can be done efficiently, maybe even by an operator or a local technician instead of that expensive far-away expert. Show the right tools to use, the right steps to take, safety instructions, video clips of previous similar repairs done by experts. Ensure the quality of maintenance work. Use checklists that make sure all steps are gone through in the right order and completed. Use AR tools to document the work while your working, forget filling up paper forms and re-typing them into your systems. Record completed tasks, add photos and videos attached to the right work phases. A worker wearing smartglasses has a quick access to the right control panel and parameters. Finally, let’s throw here some numbers about the costs. 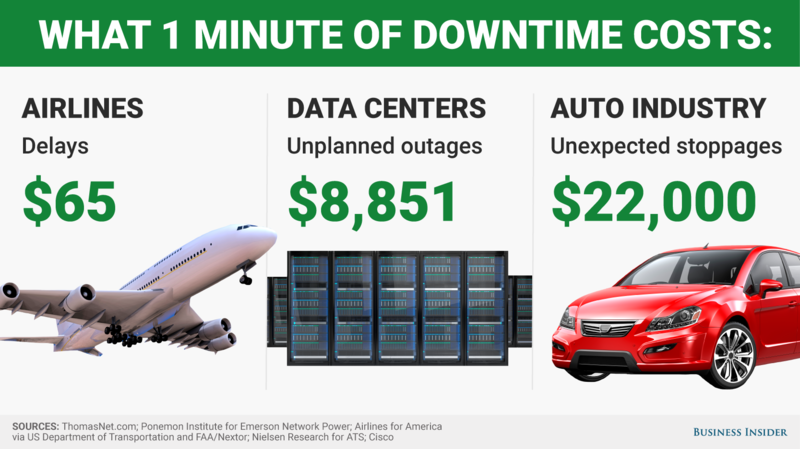 This Business Insider graphic shows how expensive unexpected downtime can be: in automotive industry a minute of unplanned downtime can cost $22 000. These numbers are not new but still very valid. Another study on British manufacturers reported last year that on average 3% of all working days are lost annually in manufacturing due to faulty machinery, equating to 49 hours of work and £31,000 per company. According to the UK manufacturers in the study, 53% of machinery downtime is caused by hidden internal faults. Similar numbers are referred to with US manufacturers in another article: unplanned downtime costs industrial manufacturers an estimated $50 billion annually. Equipment failure is the cause of 42 % of this unplanned downtime. In the light of these numbers, AR has a huge potential in helping improve the bottom line by helping minimize downtime. You can start with industrial AR no matter where in the digitization continuum you are in. In a fully digitized smart factory it is a short step to take. If you’re not there yet, start small. Define the critical process and equipment in your factory and the key data points and start deploying AR to secure an efficient uptime of your production lines. If you'd like to know more about how to get started, have a look at this checklist. We're happy to help you on the way.